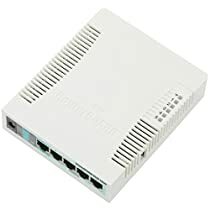 MikroTik Ethernet Router RB1100AHx2The RB2011 is a low cost multi port device series. Designed for indoor use, and available in many different cases, with a multitude of RB2011 is powered by RouterOS, a fully featured routing operating system which has been continuously improved for fifteen years. Dynamic routing, hotspot, firewall, MPLS, VPN, advanced quality of service, load balancing and bonding, real-time configuration and monitoring - just a few of the vast number of features supported by 2011UiAS-RM, in comparison with RB2011L series, not only has five Gigabit LAN ports and five Fast Ethernet LAN ports, but also has RJ45 serial port, microUSB port and more RAM (128MB instead of 64MB). Also, it has RouterOS L5 license (instead of L4) and nice touchscreen LCD for configuration. SFP cage is also present (SFP module not included. )There is PoE output function for port #10 - it can power other PoE capable devices with the same voltage as applied to the unit. Maximum load on the port is 500 and recommended to use with MikroTik SFP modules: S-85DLC05D, S-31DLC20D and S-35/53LC20D (not included) RouterBOARD 2011UiAS-RM comes with 1U rackmount enclosure, LCD panel and power supply. I've had this router for a while now.. I run an IT business out of my home and I do demos for prospective clients for new tools and such.. and while I've been in IT for almost 20 years now, I am not a networking professional so I was a little worried about making sure I get everything I can out of it. I've found this product to be a labor of love. There's a lot of work involved if you don't know networking, but the thing works, and it works consistently. Having done a bunch of research, I was able to set up IPSec VPN tunneling, a nice border firewall, I've got three networks with two DHCP servers, a wireless router, an L2 managed switch that does my VLANs, all connected to Comcast through Mr. Mikrotik here. Everything works as expected. The remote management features are excellent, I'm able to change NAT and Firewall rules on the fly and control at a very low level what comes in and goes out of my network even when I'm away (be careful, you could cut yourself off though!). I recommend this router to folks that know something about networking.. if you've never set up a real router from scratch before, prepare to take some time to learn the concepts. There is no port that's labeled "INTERNET", you have to define that, set up the IP addresses and networks, and the source-NAT Masquerade rule to talk to the internet. And that's just so you can hit Amazon, we haven't talked about getting VPN or VLANs going. But once you get it all set up... it's worth every bit the money. And one more personal note... this product is made in Latvia, and most of the documentation is in broken English in Wiki-style format on the web. It can be hard to find what you're looking for, but they try to make it easy, and it's obvious they try. It really endears me to the company. Hence.. a "labor of love". But this is not a toy and you wont get the best of it by just being intuitive through the configuration options like you did with your previous "small business routers"
There plenty of examples in the web, but the official documentation is for people who "already knows" and just want to consult a particular item. I'm very happy with this router, still learning it. Poweful workhorse of a router at a great price. This a powerful solid workhorse of a router. For the price, it's a great performer. 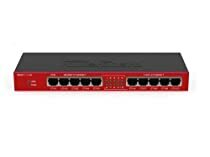 I also like that it has hardware based encryption capabilities that enable IPsec and other encryption mechanisms to not drag down the routing CPU capabilities, which make this a great security appliance that can do IPSec/L2TP/OVPN tunneling at high speeds. I have some of these deployed that haven't been rebooted in over 2 years. If you compare the horsepower to Cisco you'll pay 5x or more.